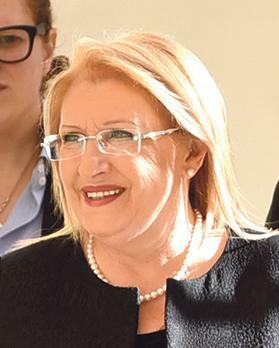 The President of Malta, Marie-Louise Coleiro Preca, is actively seeking a second spell in office after her five-year term expires in April 2019, The Sunday Times of Malta is reliably informed. Sources close to Ms Coleiro Preca’s office have told Times of Malta if this does not happen, she is not excluding a political comeback by contesting the MEP elections, scheduled for May 2019, on behalf of the Labour party. “The President is very eager to be given a second term, particularly as she is relatively young for her position,” a source within San Anton Palace said. A second term would only be possible, however, with an amendment to the Constitution, which would require a two-thirds parliamentary majority and therefore an agreement with the Opposition. It is regarded as unlikely that the Opposition would agree. However, the President’s office is viewing the possibility of a constitutional reform convention, proposed by the Prime Minister, as a window of opportunity, sources said. They said the President had sent “several diplomatic signals” to both Prime Minister Joseph Muscat and Opposition Leader Adrian Delia that she wishes to remain in office after her time is up in April 2019. Neither leader is known to have committed himself in any way. One factor that is seen to be working against Ms Coleiro Preca’s chances is the recent controversy over the 2015 Paqpaqli car show accident, in which 21 people were injured and are now suing the organisers. The President has declared she was not involved in any way in the organisation of the event, which falls under the presidential charity, the Malta Community Chest Fund. By contrast, President Emeritus George Abela has told the court he was deeply involved in its organisation. The Prime Minister is also under pressure from Labour Party grandees who may be eyeing a presidential end to their career, The Sunday Times of Malta is told. As a second option, it is not being excluded that Ms Coleiro Preca might try to stage a political comeback by contesting the MEP elections. However, this is not an option she is keen on, San Anton sources said. “In Malta’s political tradition, those serving as president never touch active politics again. This is also the wish of the incumbent President. However, the dilemma of what she will do after her term ends is something constantly on Ms Coleiro Preca’s mind,” an aide to the President said. Close aides also confirmed that the MEP option is still on the cards, despite the Office of the President having flatly denied a recent report in Malta Today that she might contest the 2019 European Parliament elections. This newspaper sent questions to the Office of the President, asking her for her position on a possible second term and a possible bid for the European Parliament, but no replies were forthcoming despite several reminders. Ms Coleiro Preca has been one of the Labour Party’s strongest vote pullers in every election since 1998. 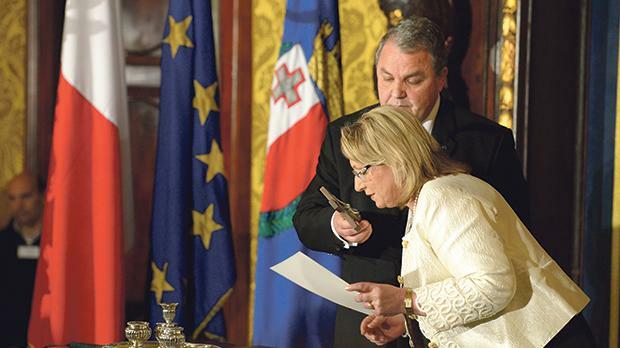 However, in a surprise move, Joseph Muscat nominated her as President in 2014, only a year after Ms Coleiro Preca had been made social policy minister in Labour’s first Cabinet. The President was said to have been very reluctant to occupy the post but gave in to pressure from Castille. Partit Demokratiku leader Anthony Buttigieg was immediately dismissive of the idea. Writing on Facebook, Dr Buttigieg argued that amending the Constitution to suit the "whims and requirements of individuals" was slippery slope that led to kissing democracy goodbye. "There is absolutely no reason for President Coleiro Preca to seek a second term," he wrote. "Although she may need it, the country does not." In a brief reply, a spokesman at the Office of the President said no talks about President Coleiro Preca serving a second term had been held. "Contrary to what was alleged in the story, there have been no discussions - formal or otherwise - on the possibility of Her Excellency serving a second term as President of Malta," the spokesman said. The Sunday Times of Malta story made no reference to "discussions", instead highlighting "diplomatic signals" sent to the Prime Minister and Opposition leader. "The President remains fully committed to her role, to which she has dedicated unerring commitment and energy," the spokesman concluded. In Malta’s political history, none of those elected to the post of President of Malta has served a second term. This tradition could have been overturned in 1999, when the Nationalist administration of the time, led by Eddie Fenech Adami, proposed an amendment to the Constitution in order for President Ugo Mifsud Bonnici to stay in office for another term. But the Labour Opposition objected, despite former Labour leader Alfred Sant having an excellent relationship with Dr Mifsud Bonnici. Dr Sant argued that in the political climate prevailing then, it would be more appropriate to elect a president from the Labour camp. The Labour Opposition proposed former minister Edwin Grech for the position. The PN government did not take up the suggestion, and Parliament elected then deputy prime minister Guido de Marco as Malta’s next president.